I heard an interesting radio program the other day as I was driving over to Santa Cruz to meet my cousin for a haircut. It was about the Harlem Children’s Zone program, which has gained national notoriety through President Obama’s recognition of it as a national standard for improving inner-city children’s lives. The goal is to reach a neighborhood tipping point in which poverty is overcome by education. The founder, uses an analogy of a conveyor belt, or rather a series of belts, to lift children out of poverty through education, community centers and foster care prevention services. Different from other programs they focus on setting up children to succeed starting at birth with the hopes of raising this generation out of poverty while possibly leaving their parents in it. Most of their success may be taking place before children even reach kindergarten. provide planning grants to non-profit, community-based organizations for developing neighborhood programs, modeled after the Harlem Children’s Zone. These programs are to be designed to combat the effects of poverty and improve education and life outcomes for children, from birth through college. Will one of our local communities be selected as one of the twenty Promise Neighborhoods? Wow, I sure hope so. It seems like an incredible program and it would be a shame to not have at least one of the Bay Area cities involved in it. What do you think? 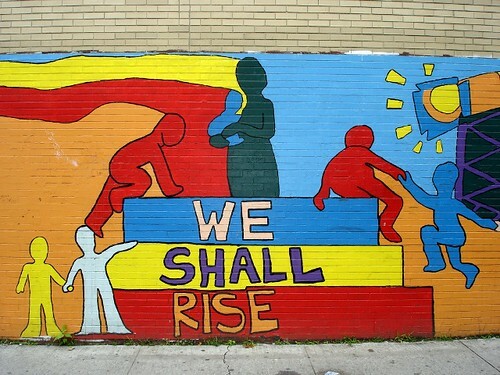 Have you heard of either the Harlem Children’s Zone or the Promise Neighborhoods programs? Do you think it’s a worth while initiative?